Daniel Defoe’s vivid descriptions of all of the places that Robinson Crusoe traveled around the world, including Southeast Asia, China, and Siberia in the novel’s sequel, are all the more impressive since he never traveled to these regions himself. Scholars have long debated precisely which sources Defoe drew on to create Crusoe, but the process of borrowing second or third hand travel accounts is well known. As described in this work, fictional accounts were frequently incorporated into works that were intended to be truthful and accurate. 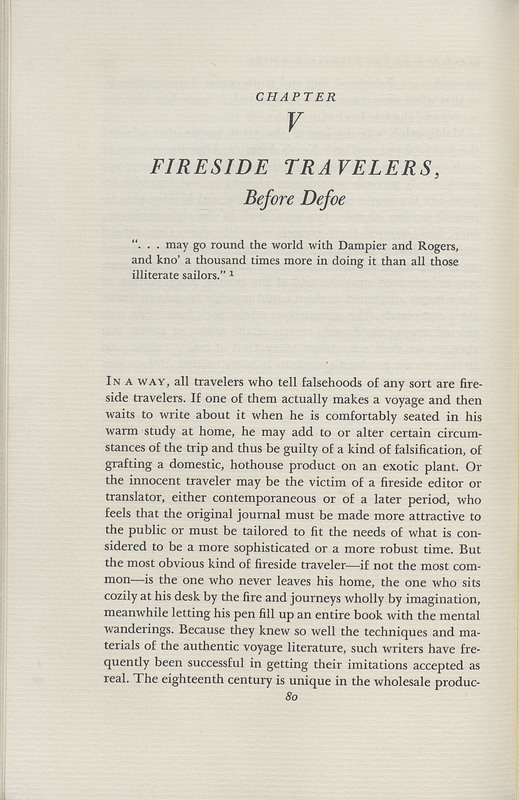 In discussing the development of fireside travelers, “one who sits cozily at his desk by the fire and journeys wholly by imagination,” Adams uses Defoe as a point of demarcation after which fictional travel literature, stories intended to entertain rather than educate, became commonplace. Travelers and Travel Liars, 1660-1800. Berkeley: University of California Press, 1962.